A procedure has been developed for the synthesis of gold glyconanoparticles with an average particle size of 15–30 nm and a low polydispersity index on the basis of natural hexose (d-glucose, d-galactose, d-mannose) sulfanylacetyl-, 3-sulfanylpropanoyl-, and 2-sulfanylbenzoylhydrazones and thiolated poly(2-deoxy-2-methacryloylamino-d-glucose). Russian Text © A.Yu. Ershov, M.Yu. Vasilyeva, M.L. Levit, I.V. Lagoda, V.A. Baygildin, B.M. 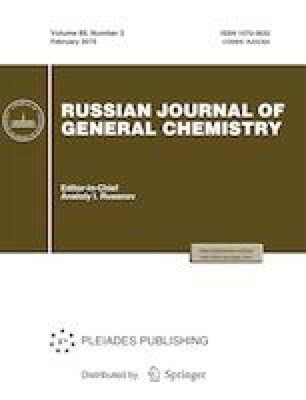 Shabsels, A.A. Martynenkov, A. V. Yakimansky, 2019, published in Zhurnal Obshchei Khimii, 2019, Vol. 89, No. 2, pp. 309–318.